Chef Anne Burrell’s culinary flavors are just as big as the personality she shows off on her Food Network show, Secrets of a Restaurant Chef. It’s no surprise, then, that her first cookbook, Cook Like a Rock Star ($28; Clarkson Potter), is brimming with outrageously tasty bites, like this inventive appetizer. Coat a large sauté pan with 2 tablespoons extra virgin olive oil, and add 2 diced onions, a pinch of crushed red pepper, and 1⁄4 teaspoon kosher salt; bring to medium heat. Cook onions until soft and aromatic (8–10 minutes), stirring to make sure they don’t brown. Add 2 cloves smashed garlic and cook for another 2–3 minutes. Add 1 red and 1 yellow bell pepper (seeded and cut into 1⁄2-inch diamonds), 1⁄4 cup water, and 1⁄4 teaspoon kosher salt. Cook until peppers have softened and water has evaporated, another 8–10 minutes. Add 1⁄4 cup tomato paste, 1⁄2 teaspoon smoked paprika, and 2 tablespoons sherry vinegar; stir to combine. Cook until the peperonata comes together and looks tightened up and slightly thickened, 6–7 minutes. Remove from heat and let cool. Transfer an 8-ounce log of goat cheese to a serving bowl, squish with a spatula to flatten, and nestle the peperonata in the center. 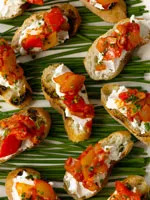 Garnish with chives, if you like, and serve with toasted baguette slices (15-inch baguette, sliced into 1⁄2-inch pieces).